By the time your baby grows into full toddler-hood, the changes are coming fast and furious—especially when it comes to brain development. The toddler years are full of discovery as your toddler learns all sorts of new skills. Music has shown to increase working memory and help toddlers learn how to pay attention. One particularly fascinating study linked language development to rhythm and showed that toddlers and children who have better understanding of rhythm are able to form more complex sentences earlier. Another high-quality laboratory study showed that early music training among toddlers helped the children detect and predict “auditory patterns” faster. Researchers believed this would help the kids learn how to speak earlier, as well as use more complex language. In fact, music and language are linked so closely together that bilingual kids have increased sensitivity to tone and rhythm. 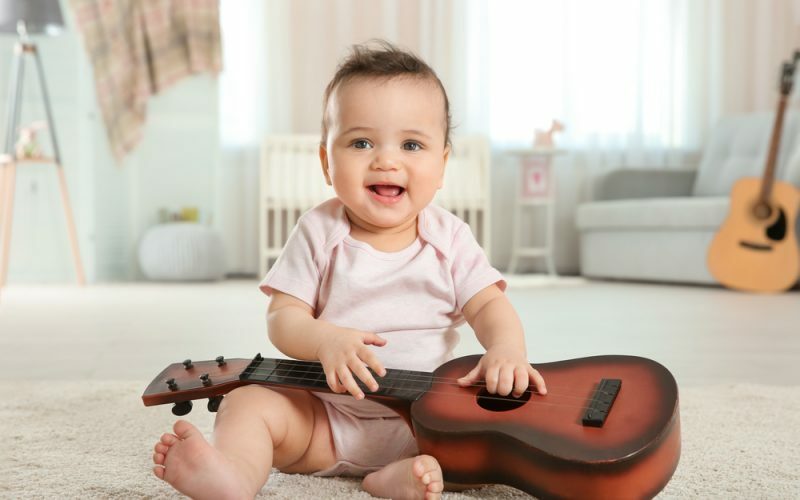 This means they are better able to identify complex songs and rhythms, because the parts of the brain that handle language also help toddlers understand musical concepts like pitch and tone. Perhaps not surprisingly, exposure to music during these years has also been shown to help relax active toddlers and help them transition between emotional states. A bedtime routine that includes lullabies or singing is a great way to help your children developmentally, simply through exposing them to the basics of rhythm and sound. Studies show that kids who have this type of routine have positive outcomes with emotional and behavioral regulation, parental bonding, and language development. Finally, music has been shown to increase toddler’s physical development, by helping them learn fine motor skills. In one study comparing kids in music lessons to those taking sports lessons, the children in music classes actually learned their fine motor skills faster than the children taking a sport. Toddlers’ brains are developing rapidly. Music and language are closely linked in the brain. Toddlers who learn music can learn language faster. Music also helps toddlers transition between emotional states better. Liu L, Kager R. Enhanced music sensitivity in 9-month-old bilingual infants. Cogn Process. 2017 Feb;18(1):55-65. Mindell JA, Williamson AA. Benefits of a bedtime routine in young children: Sleep, development, and beyond. Sleep Med Rev. 2017 Nov 6. Martins M, Neves L, Rodrigues P, Vasconcelos O, Castro SL. Orff-Based Music Training Enhances Children’s Manual Dexterity and Bimanual Coordination. Front Psychol. 2018 Dec 21;9:2616. The best things you can do for your child is love them, encourage them, sing to them and with them and read to them. Play with them and set boundaries. Good luck. I’m 69 and a retired Educational Therapist. I still do these things with my little Grandchildren. My youngest is 2 and oldest is 23 and gave me my 1st Great Grandchild just over 1 year ago. Love and Enjoy them. Yes! A thousand times, yes! I hope you are enjoying ever minute with them.